All pictures by Vincent J. Docherty. Copyright Vincent J. Docherty. Click on a photo and use the comment/caption mechanism to send a message to ask about permission to use. Thanks to Mike Kennedy for caption help on this page. 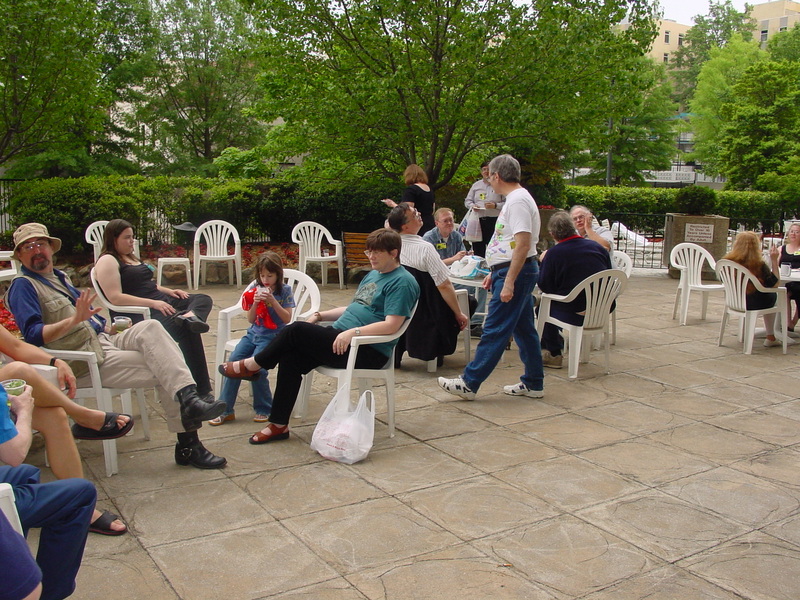 Roger Sims, at the UK in 2005 table. Pat Sims, serving up green drinks. Pat Sims, serving up green drinks to someone. Someone, someone else, somebody, somebody else, and 6 others. 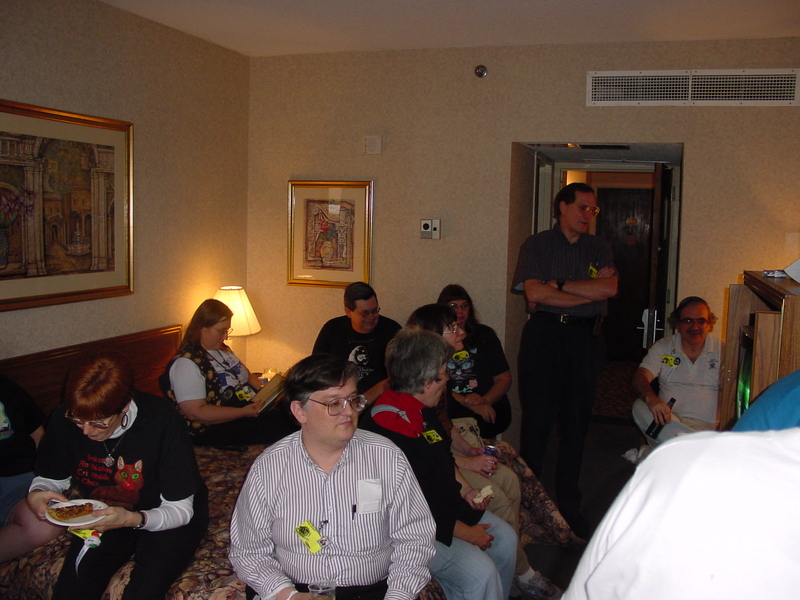 Redhead at edge of bed, Judith C. Bemis in vest by lamp, Doug Lampert on edge of bed in striped shirt, Tony Parker behind Doug and next to Judy, lady with red, someone behind her, Anita Feller in black t-shirt by the wall, somebody standing in doorway and Tom Feller seated at right. Someone, someone else, somebody, somebody else, and 9 others. Someone background left, man standing, woman standing, dude in grey sitting next to Randy Cleary in red/white stripes, somebody coming in the door behind Gary Robe in light blue shirt holding a cup, lady in yellow, person in blue with hand to his face, Adrian Washburn in multi-colored tank top in foreground, somebody else standing in front of curtain, woman with red collar, blonde boy, girl with red toy, someone else in the far back corner, man in grey, woman in black/white. And someone's elbow, foreground right. Someone, someone else, somebody, somebody else, and 13 others. 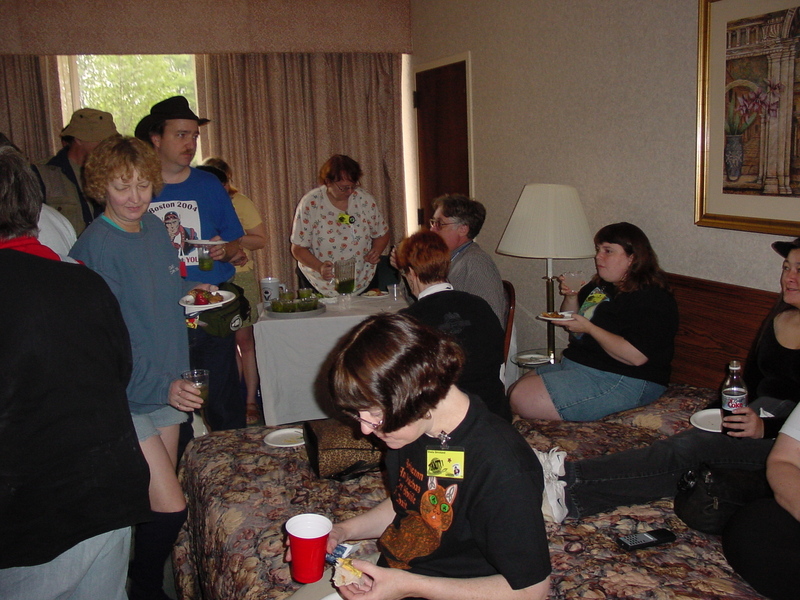 Guy's head foreground left, man in background standing with arms crossed, woman on bed with red collar, guy in corner leaning over someone else at table (obscured), person in grey, redhead with glasses, Adrian Washburn in multi-colored tank top on bed, Corlis Robe in black by lamp, Gary Robe with light blue shirt, Naomi Fisher in black, Tom Feller's head in foreground, Judith C. Bemis at right. Steve Francis at left, Corlis Robe, Gary Robe, Naomi Fisher, and Judith C. Bemis.